Suits, fedoras, lamps, custom tailoring at Olaf's on Court near Fourth Place. 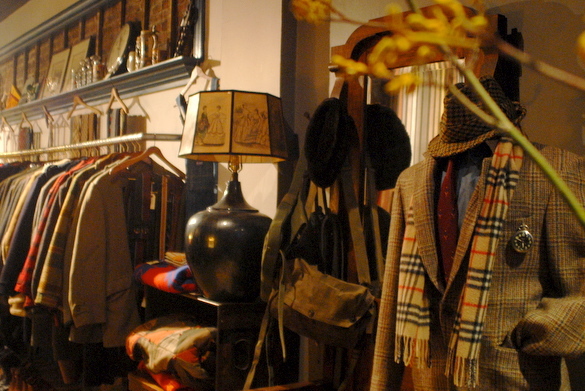 Walking into Olaf’s on southern Court Street is like visiting your stylish friend’s wardrobe, a closet you always wished you could grab from. Well, now you can. The owners, Jeanne Messing, a designer, and Jen McCulloch, owner of Olive’s Very Vintage on Court, opened a week before Christmas in an area of Court Street that has quickly become a destination for shopping, eating and hanging out. Olaf’s feature pieces such as a 1970’s Levi’s shadow plaid shirt ($85), skinny silk and knit ties from the 1960’s ($18 to $64), an L.L. Bean pin-striped plaid coat from the late 1930’s ($295), several Harris tweed blazers ($85 to $165) and tweed and wool fedoras ($35 to $65). Though the selection is on trend, McCulloch says the items are wearable. McCulloch named Olive’s after her mom, Olivia. Olaf’s is named after her mom’s grandfather. Before she opened her line of vintage boutiques, McCulloch was a window designer for Saks Fifth Avenue and a set decorator and art director for children’s films. She buys most of her items from towns in Pennsylvania and Virginia. She says if you find a town that has a conglomeration of vintage, antique and flea, go there to shop. Because rents were so high, she opted for Court Street. McCulloch exudes a down-to-earth mentality. Olaf’s has an in-store seamstress to tailor suits, shirts, pants. “If you come into the store, we really want to help you. We’re not just trying to sell to hipsters,” says the PS 58 mom. McCulloch is from Maryland. She always sold vintage on the side but got the urge to open her first store after having her son, Evan. She was a stay at home mom for his first year. Open daily noon to 9 p.m.